Medavir is a colorless, virtually scentless product that prevents recurrences and reduces the quantity of virus in the body with subsequent treatments. You use the product before or during an outbreak. When you start to feel one of the outbreaks coming on, you simply apply the gel. You will feel a burning and itching sensation in the affected area. One of the most important benefits of the gel is that it does not have any side effects. You don’t have to be concerned about all of the side effects that some of those prescription drugs can cause. The medicine is safe enough that you can even use it inside your mouth if that is where you have your outbreaks. Medavir uses formula of stannous fluoride that claims to be very effective against herpes virus. The effective ingredients are proven to work with numerous research papers. Medavir is not something you would apply daily to prevent an outbreak from happening. We experienced some stinging when applied on the sore directly, nothing will happen if its applied to unbroken skin though. Medavir is expensive. Available online only. 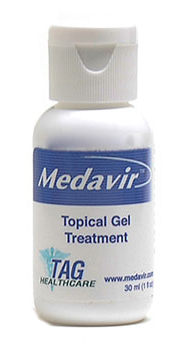 Overall we have had success with using Medavir, we didn’t experience any side effects and the gel seems to speed up the healing process as well as eliminating the blisters.Over the last 9 years, Medavir has been used by over thousands of satisfied customers and is available through TAG Healthcare. The company provides an unconditional 60-day money back guarantee. Please note refunds are limited to the initial purchase and 2 bottles of product. Anyone who is suffering from herpes should take the time to research the product further and see how it can help. I ordered Medavir On August2nd. Its has been 2 weeks now. I never recieved package and when I track my packge, It only shows that “electronic shipping info was recieved.” and no further scan transaction.. I called the company many times only to get an answering service. what should i do??? It works great in combination with Valtrex. Ive been using it for more than a year now. Is there anything better out there? I’m sure someone must have tried Medavir before. Does it work> I just ordered it (guess i should have asked beforehand) Just curious because heard something about false rankings on H meds and was wondering if this was it. Have you tried it/what has worked the best for you?